I am at a loss to explain how I have never had this before. I think it's probably one of those beers that I just assumed I have had before. 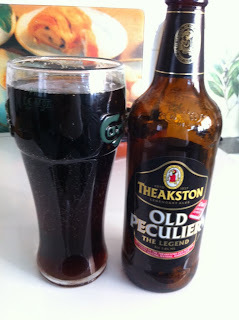 The most peculiar thing about Old Peculier is the name. I am not entirely sure what the name means. Maybe it has been lost in time? As far as I know, it is just an old spelling of peculiar which is often these days taken to mean odd or strange when in fact it is more like the word particular or specific. For instance if you smelled gas, you might say "there is a peculiar smell of gas" and proceed to call the gas company. Anyway, the name aside, how is the beer? Well quite drinkable and moreish I have to say. It pours like a coke with an initial fizzy head that within moments has dissipated, never to to return no matter how much swirling you do. You might get better results from a snifter but I would expect some sort of foam after swirling in the Carlsberg glass I was forced to use due to my location. I took a sniff and caramel, some booze, dried fruits, a little orange marmalade and some metallic hops. So far so good, I don't mind metallic notes as long as they do not dominate the beer. Probably from the fuggles though I usually get it more from East Kent Goldings. I took a taste and was somewhat surprised by how thin and watery the beer was. Oh it was packed with flavour but it just seemed to be lacking in body and that meant the beer was not as good as I expected. It was also quite fizzy, perhaps too fizzy for an old ale and I was again reminded of a glass of coke. I could have sucked it up through a straw. And then, that's the nub of it there. Coke is a very drinkable soft drink and the thinness of body from Old Peculier meant that I could just drink more and quite quickly. The finish is somewhat bitter but there is a lingering sweetness. The slight metallic twang was present throughout but it was not deterring from the beer itself. A number of Shepherd Neame beers are far more pronounced with their coppery notes. At the end of the day, I had three beers that night. Two were Old Peculier and the third was a Hobgoblin. I missed the Old Peculier while drinking the Hobgoblin so I think that says plenty about my ultimate impression of the beer. I just wish it had more body so I would drink it slower. A peculier was a type of court, I think an ecclesiatical court, however one that was outside of the control of the local diocese, rather it was directly under the control of the sovereign as far as I understand. It just means that it is a place outside of normal jurisdiction, mostly, if not all abolished now. The name comes from "The Peculier of Masham" as the label says, so I presume there was one such court in Masham. Surprised you hadn't had it, it's an old fav of mine, partly sentimental, it was on tap in my local in Edinburgh when I first got in to decent beer! Yeah I came across the mention of a court but was not sure. I think a peculiar is more normally a church, one under the control of a local power rather than the bishop. Most peculiars are royal peculiars: the chapels in castles and the like. The Chapel Royal in the lower yard of Dublin Castle is Ireland's only peculiar, which is why I named my Old Peculier clone after it. Interestingly, a search on Google images shows that Old Peculier used to use the more normal spelling. Yeah I came across mention of a church as well. I was simply not going to list off all the possibilities and as Richie said, the bottle indicates it is likely the court. The Tale Of The Ale: Not so peculiar after all.